A reason for e-commerce investors to feel a bit more jolly? Amazon.com Inc. plans to hire 70,000 seasonal workers for its U.S. warehouse network this year, a 40 percent increase that points to the company’s upbeat expectations about the holiday selling season. Cyber Monday spending hit $1.5 billion in the U.S. to make it the biggest shopping day in history, according to comScore, which tracks purchases made on computers using broadband connections. The firm reports that on Cyber Monday, which falls on the Monday after Thanksgiving, spending was up 17 percent year over year, and that overall, e-commerce spending for the first 26 days of the holiday season has totaled $16.4 billion, a 16 percent increase over last year. ComScore does not include purchases made over mobile devices, which by one account is estimated to be contributing as much as 13 percent of sales this season. Deal-seeking shoppers in the U.S. are expected to spend $68.4 billion online this holiday, according to Forrester. 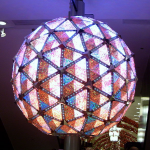 It’s said a billion people watch the six-ton ball drop every year. Here’s more than you ever wanted to know about it. A new deal bundling HP’s TouchPad tablet with its PCs is probably the device’s last hurrah. For real this time. A 4.3 Million Mac Quarter for Apple? Apple is headed toward another record-breaking quarter for Mac sales. That’s the indication from the latest NPD retail data, anyway. Consumers will proceed with caution when it comes to spending this holiday season–especially on electronics. According to market research firm NPD Group, 61 percent of people taking part in its annual holiday survey say they’ll spend the same amount of money on gifts as last year, but five percent fewer are likely to spend it on electronics, videogames or DVDs. You wouldn’t know it from Research in Motion’s share price today–down 3.35 percent at $46.74–but analysts were generally impressed with the PlayBook, the “professional tablet” the company announced at its developer conference Monday. Barnes & Noble’s Nook Finally Limps Into Stores. Too Late? Did You Buy Your Christmas Presents on Your iPhone This Year? 600,000 Droids Deployed in 2009?